We would like to thank the Hubbard Family (JHFARMS) for allowing us to add this fine young buck to our herd. Crunch’s Captain has a beautiful head with long wide frosted ears, with a long, elegant neck that blends into a smooth set of shoulders. 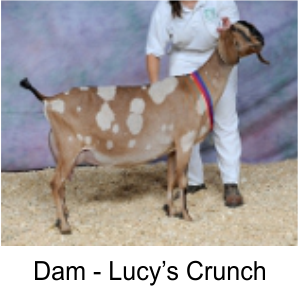 His Dam, JHFarms Lucy’s Crunch, appraised 92 EEEE for 2014, and was the 2011 A.D.G.A. National Show Grand Champion. Captain’s paternal sister placed first in her Junior class at the 2013 A.D.G.A. National show. 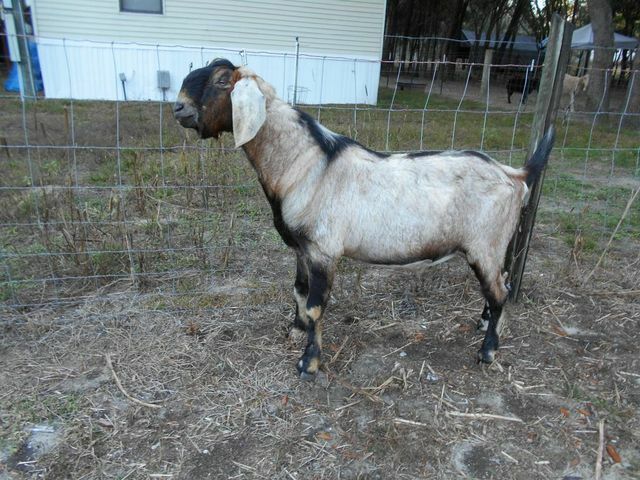 Captain’s sire, Sarku has a beautiful, full wide head and is a powerful buck with ample dairy character. He has tremendous depth of body, with wide, open ribbing. He sports an ideal Nubian head with large dropping ears and a prominent nose. 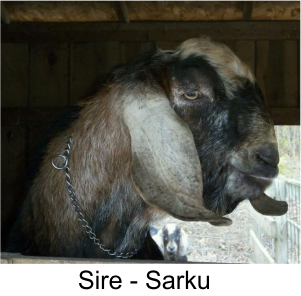 Sarku’s daughter was the Indiana State Fair Jr. Champion as well as placing 2nd in her senior kid class at the 2011 ADGA National Show. In 2013, Sarku was GCH at the Hoosier Classic, his first show ever. In Captain's daughters he has improved height, strength in feet/legs, front end assembly brisket extension, width, breed character, and smoothness of blending. His siblings are showing well also.